I haven’t been crocheting much this year. Unfortunately, I’ve discovered that when I crochet often, I get a lot of pain in my right shoulder blade. I imagine this is because I’m working the muscles in that arm while doing nothing in my left excepting holding yarn in place. It’s too bad I can’t switch arms periodically. Anyway, when I moved back to Texas this summer, I splurged on some Caron Cakes yarn. This yarn came out right after I moved to Wisconsin, and in our rural area, there was only one store that sold yarn (and not the Cakes). I had been longing to get my hands on some Caron Cakes for over a year, hence the splurge. But what to build? Another discovery from the last two years of yarn art: I dislike sewing. My longterm afghan project is temporarily on hold because it involves hand-sewing over 400 squares together. UGH. Not fun. But I did want to make an afghan or bedspread, and this seemed like the perfect yarn for it. 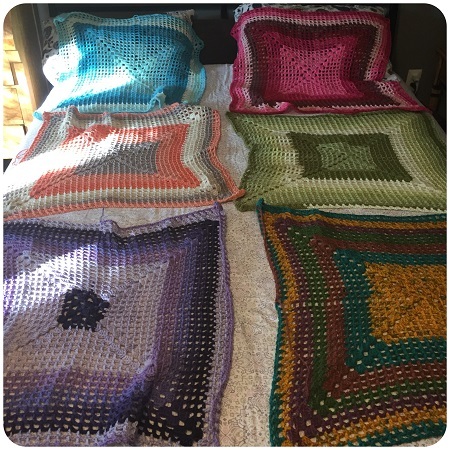 I found a fun non-traditional granny square pattern and fashioned six gigantic squares from six different Cakes (Cherry Chip, Pistachio, Strawberry Trifle, Bumbleberry, Fruit Cake, Faerie Cake). I wanted the colors to work well together but to also contrast, like the different seasons in a year or some such thing like that. Then I chose a color that worked well with all six Cakes, bought a gigantic skein of yarn (Loops & Threads Impeccable in Aran), and worked a few rounds around each square. 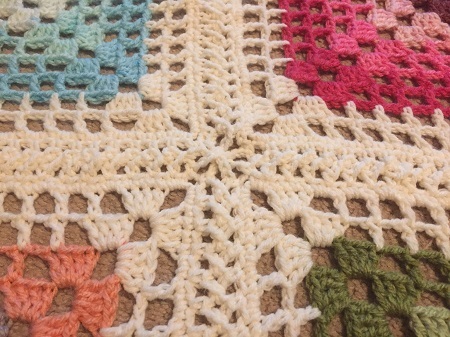 I used a braided technique for crochet-joining the squares (no sewing!!!) that I found at Crochet 365 Knit Too. All connected, the joins worked well, though I ran into two problems. 1) My giant skein of yarn – 858 yards! – was about one yard too short. Thankfully my son had a skein that was nearly the same color and only slightly different in texture, so I fudged half of one side of one square. You can’t tell unless you know where to look. Whew! 2) My initial single crochet edge was too tight, causing the squares to pull at the corners. After the braid join, this led to wavy edges, longer corners, and bunched up sections where the corners met. Unfortunately, this is something that can’t be fixed with blocking. It’s simply an excess of yarn in places. 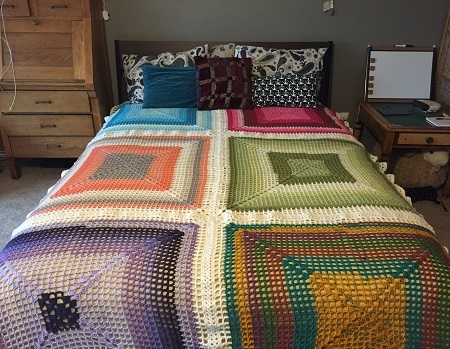 I know what I ought to have done differently – and hey, if I had, I wouldn’t have needed that extra couple feet of yarn – but what’s done is done, and it’s pretty enough on a bed even with the wrinkles. 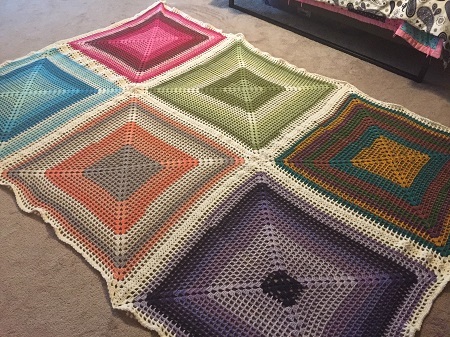 I’m satisfied, and I got the Caron Cake bug out of my system. Altogether the project took about two months. Considering the other afghan I’m working on has been ongoing for almost 18 months now, it feels good to be finished with a larger project quickly! That is beautiful! I don’t see any errors or wrinkles at all, so I think you are being too hard on yourself! You can, but it either has to be done with an overlapping stitch (like this project), or it creates a pretty bulky seam, or the connection is weak and easily breakable. I agree – it’s definitely better to have a project that builds as you go!